French skincare is my absolute favorite skincare because it's high quality and never fails to show results. 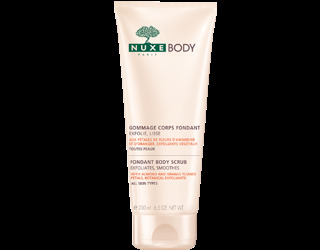 So I was thrilled when NUXE recently contacted me to review their brand new line of natural body care called NUXE BODY. One thing's for sure, the french know skincare so if you want to try good quality, natural based products, you've gotta try NUXE! 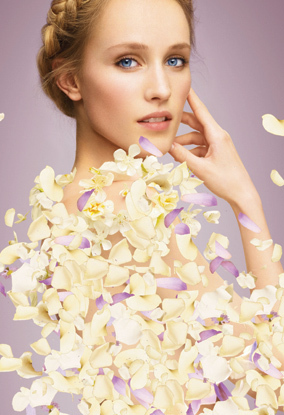 NUXE Paris is a leading french skincare brand based on botanicals and essential oils. Founded in 1957 by a pharmacist who had a passion for phytotherapy and aromatherapy, the brand was taken over by Aliza Jabès in 1989 who gave it a fresh start. You can feel good about using NUXE because they've commited to making their products Non-comedogenic, Free of parabens, Synthetic colorants, Mineral oil, Animal ingredients as well as to using Natural active ingredients and specializing in products for all skin types including; dry, sensitive, oil and anti-aging. Here is my review. This natural body scrub is creamy dreamy and feels and smells oh so good! It's made with 100% botanical exfoliants in various grain sizes for soft, smooth skin that will make your skin feel like new. This skincare product gently exfoliates and refines the skin texture by 95%. It's made with active natural ingredients like Orange Zest, Lichee Stone extracts and Walnut Shell Powder which exfoliate while extracts of Sunflower, Corn and Coconut preserve the hydrolipidic film and Almond and Orange Flower Petals soothe and soften the skin. This body scrub is made with 95% natural ingredients and is for all skin types. 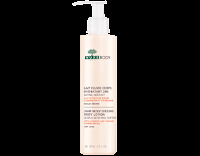 Your skin will feel like silk after applying this satiny body lotion. It's continues to moisturize for 24 hrs with an ultra-fluid texture to caress normal to dry skins. It doesn't leave a greasy after feel, restores skin and leaves it feeling soft and silky to the touch. It's made with ingredients like; Wheat and Wood Extracts that moisturize immediately, while Sweet Almond and Sunflower Oils correct skin dryness. Almond and Orange Flower Petals soothe and soften the skin. It's made with 94% natural ingredients and good for normal to dry skin. You can find NUXE BODY care line and more of their skincare line at these fine retailers: Apothica, Beauty.com, b-glowing, SpaLook and Skinstore.com. Also be sure to follow them on Twitter and Facebook.